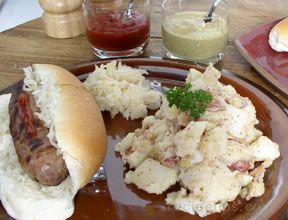 Zestily seasoned with Salad Supreme Seasoning and Hot Shot!® Pepper Blend, this potato salad would be a great accompaniment to bratwurst or roasted pork. 1. Place potatoes large saucepan. Add water to cover. Bring to boil. 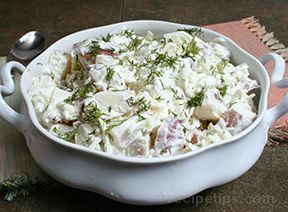 Cook 8 to 10 minutes or until potatoes are just tender; drain. Return potatoes to pan. Add corn and green onions; keep warm over very low heat. 2. 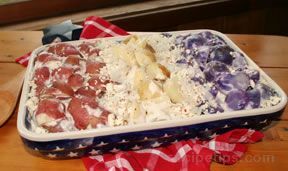 Cook bacon in small skillet or microwavable container until crisp. Drain on paper towels. Set aside. 3. Mix sour cream, Seasoning, onion powder and Hot Shot! in medium bowl. Pour over potato mixture; mix well. Spoon into serving bowl. Sprinkle with bacon. Serve warm.